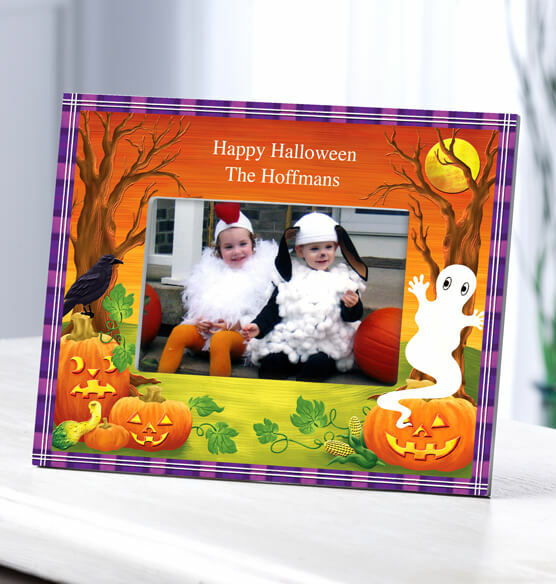 Celebrate Halloween by showcasing your favorite trick-or-treater memory inside this colorful Haunted Harvest Halloween photo frame. A purple plaid border surrounds a scene featuring a crow, ghost and Jack-o’-lanterns. Use the attached easel to create a vertical or horizontal table display or hang it on the wall. Your personalized message appears at the top. We have been doing a Halloween pic every year of our 3 boys since 2004. Even though our boys are in college/high school, we still get a picture of them even if they are not still trick or treating. The frames are all over the house. I have been collecting these frames for years for my own children. Now i am caring own the tradition for my granddaughter. i have a collection of halloween frames since I first started having kids. I have one for each year of them in their costumes. Its great to look back on the years and remember what they dressed up as. We display them with our Halloween decorations each year. Do you have a frame that reads HALLOWEEN 2017? BEST ANSWER: Thank you for your question. 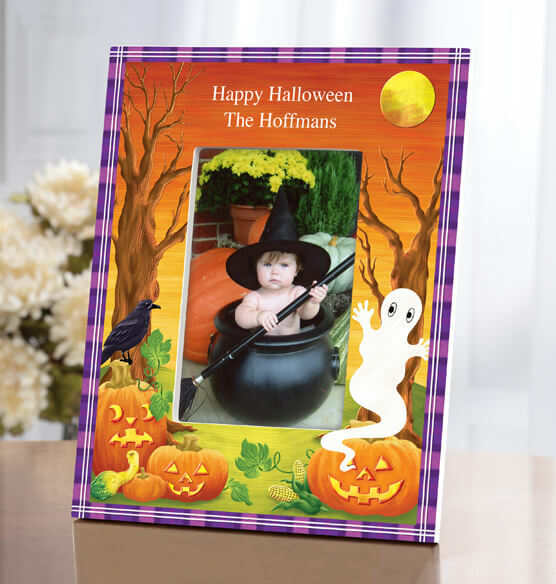 You can personalize this frame with Halloween 2017. We hope this information will be of help to you. Does it come with "happy halloween" or is that part of the personalization? BEST ANSWER: Thank you for your question. It does not automatically come with Happy Halloween. You will need to personalize it with it. We hope this information will be of help to you. BEST ANSWER: Thank you for your question. You can add the message of Happy Halloween 2017 to the frame. We hope this information will be of help to you.